Quick overview Artists as performers have radically altering our notion of what constitutes visual art. This text puts forward a method for teaching the subject as a discipline distinct from dance, drama, painting or sculpture. This finely illustrated book offers a simple yet comprehensive 'grammar' of a new discipline. Performance Art first became popular in the fifties when artists began creating 'happenings'. Since then the artist as a performer has challenged many of the accepted rules of the theatre and radically altered our notion of what constitutes visual art. This is the first publication to outline the essential characteristics of the field and to put forward a method for teaching the subject as a discipline distinct from dance, drama, painting or sculpture. Taking the theory of primary and secondary colours as his model, Anthony Howell posits three primaries of action and shows how these may be mixed to obtain a secondary range of actions. Based on a taught course, the system is designed for practical use in the studio and is also entertaining to explore. Examples are cited from leading performance groups and practitioners such as Bobbie Baker, Orlan, Stelarc, Annie Sprinkle, Robert Wilson, Goat Island, and Station House Opera. This volume, however, is not just an illustrated grammar of action - it also shows how the syntax of that grammar has psychoanalytic repercussions. This enables the performer to relate the system to lived experience, ensuring a realisation that meaning is being dealt with through these actions and that the stystem set forth is more than a dry structuring of the characteristics of movement. Freud's notion of 'transference' and Lacan's understanding of 'repetition' are compared to a performer's usage of the same terms. 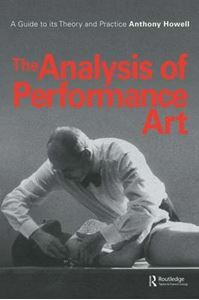 Thus the book provides a psychoanalytic critique of performance at the same time as it outlines an efficient method for creating live work on both fine art and theatre courses.